At nine months of age Fiona received a new liver because hers had been destroyed by biliary atresia, a condition affecting the bile ducts. Then, just four months post-transplant, we learned that complications had arisen with Fiona’s new liver and she would need another transplant. The plan was to try and “manage” her current liver and hope that Fiona grew as big as possible before the need for a new graft was necessary. Thankfully, her team of doctors managed that graft well and Fiona grew and lived life well. We had time before getting her back on the transplant list. Fiona was officially re-listed for a liver in April of 2013. Well, time flew by and, in a blink of an eye, Fiona (and that same liver she received almost six years prior) entered first grade last fall with great enthusiasm. 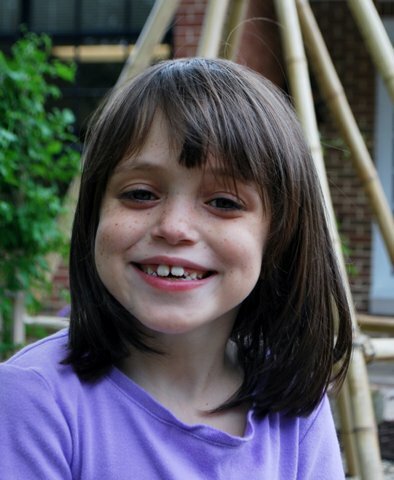 Although doctor appointments, medications, medical tests, blood draws, and hospitalizations have been an all too regular part of her life, Fiona has always been a spirited, joyful, loving, funny, intelligent, creative, and resilient girl. She is a warrior princess who has the magical ability to find joy in every situation and bring out the joy in others. After almost two years on the list, we finally received the call at 4 AM on March 2, 2015 that the team in Chicago had a liver for Fiona. Unfortunately, the surgery was far more difficult than anticipated and extended over two days. As if that wasn’t scary enough, Fiona experienced multiple complications post-transplant, staying in the Pediatric Intensive Care Unit for four-and-a-half months and spending a total of six months in hospital and rehab in Chicago. At the six-month point, Fiona was rushed from rehab back to the hospital with a high fever and very low blood pressure. She rebounded from that setback and has been in good health since. At that point, after a lot of deliberation, we decided to head home to Cleveland Clinic Children’s Hospital for Rehabilitation. Fiona is currently an inpatient and is working hard to rebuild muscle strength and flexibility. She has a hot pink wheelchair, is learning to walk with a walker, and can now independently move from lying down to sitting up among other things. Not surprisingly, she is making excellent progress. We will soon transition to day hospital, which means Fiona will receive the same amount of therapy but will go home at night and be home on the weekends. We cannot wait for the day when we are all in our home together, again. Fiona’s fund helps pay out-of-pocket and uninsured medical expenses as well as travel and relocation expenses. The fund will also help pay for tutoring since Fiona missed a significant portion of first grade and will miss much of second grade. We hope you are as inspired by our young warrior princess as we are! She continues to amaze us each day.